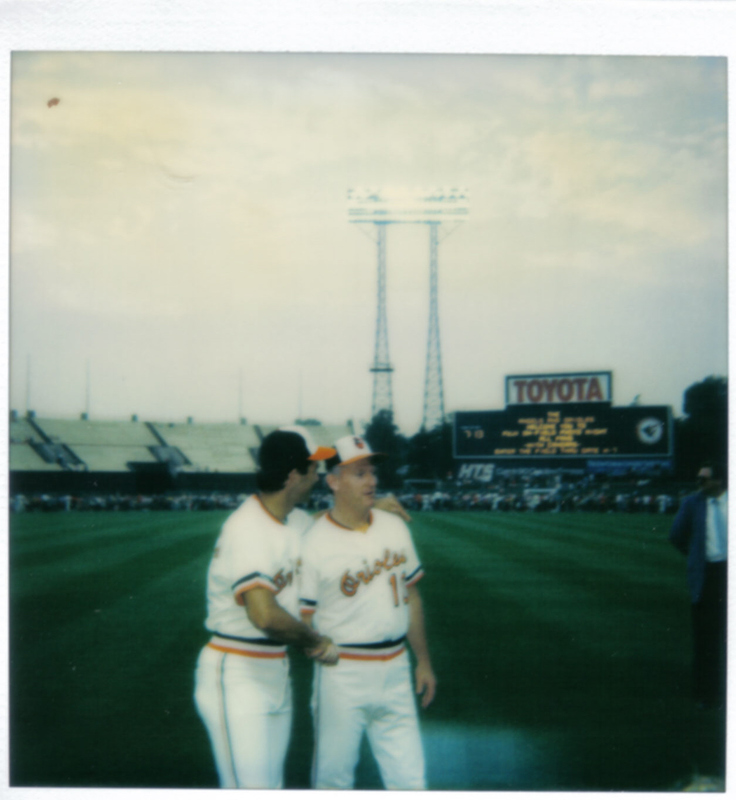 In part one we took a look at Fuji Photo Night Polaroids of Oriole legend Cal Ripken Jr., his brother Billy, injury-prone free agent acquisition Fred Lynn, and the late Alan Wiggins. 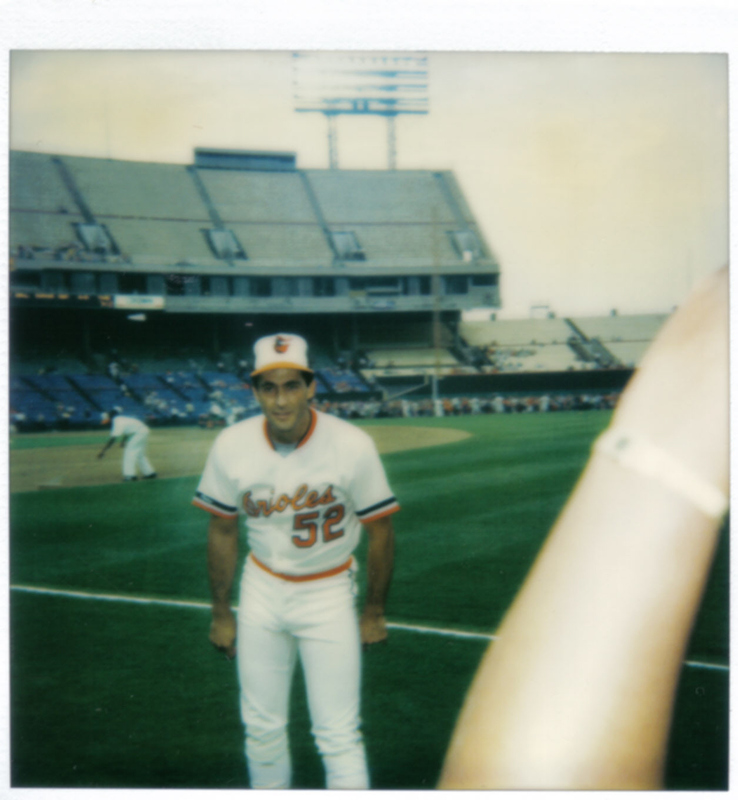 In part two we take a look at Polaroids of Scott McGregor, Mike Boddicker, and others from the 95-game losing, 6th place '87 Orioles team. Despite having Cal Ripken Jr. and Eddie Murray batting in the middle of the line up, the late 1980's Orioles were one of baseball's worst teams. You would be hard pressed to name another team that struggled so mightily despite having two future Hall of Famers in the prime of their careers. By 1987, Murray's days in Baltimore were numbered after a public squabble with owner Edward Bennett Williams. In addition, many fans had taken a liking to the blue collar Jim Traber who had filled in brilliantly at first base while the usually durable Murray was on the disabled list the previous summer. As the Orioles struggled to stay out of the cellar, more and more the boos seemed to outweigh chants of "Eddie!" "Eddie!" Not surprisingly, Murray didn't come out to pose for pictures during Fuji Photo Night. During the '87 season, it appeared outfielder Larry Sheets, would finally fulfill the promise the Orioles saw in him when they selected him in the second round of the 1978 draft. 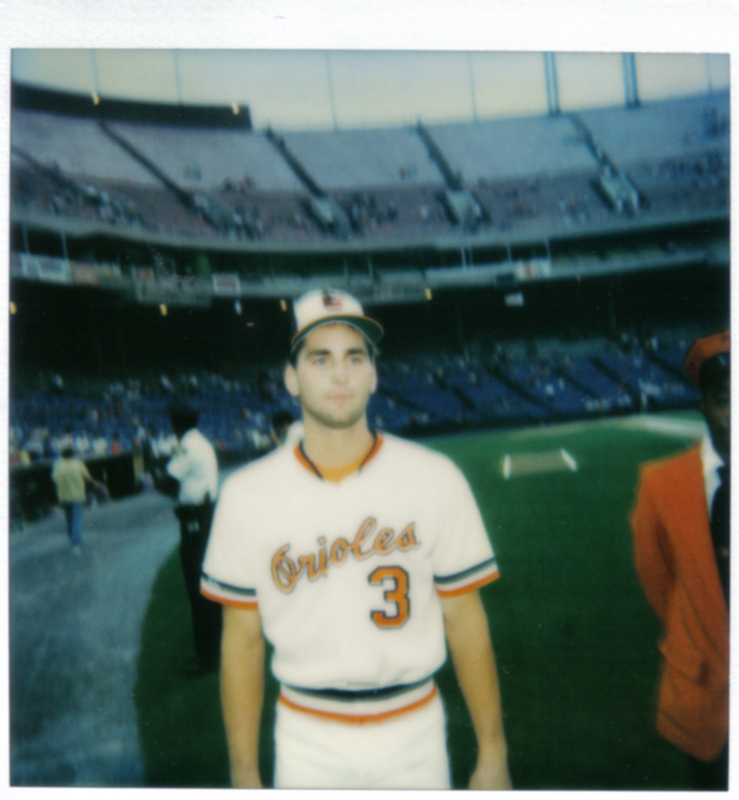 Sheets, a Staunton, Virginia, made an impressive debut in Baltimore, hitting .438 in a September 1984 eight game call up. Joining a team with an already crowded outfield, Sheets struggled to regularly make the line up during the 1985 and 1986 seasons and was used mostly at DH while also seeing action at left field, right field, first base, third base, and even catcher. During the '85 and '86 seasons, in a combined 725 plate appearances, Sheets hit 35 home runs while batting .267. When the 1987 season started, Sheets got off to hot start and finally became a fixture in the line up, getting regular playing time in left and right field. With 508 plate appearances in 135 games, the Staunton native was able to establish himself as one of the league's best hitters, drilling 31 homers, with a .316 batting average, and .563 slugging percentage--all team leading totals. 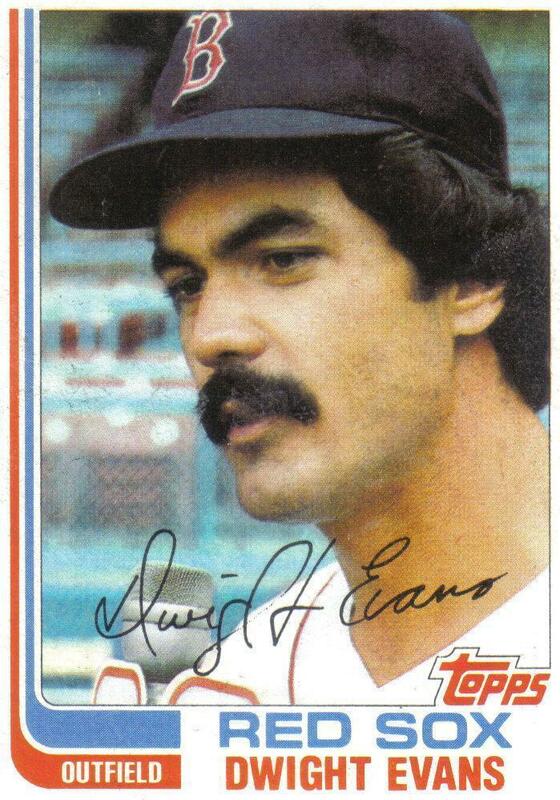 Sheets also drove in 94 runs, the second most on the team, behind only Ripken. However, despite his All-Star caliber breakout season, Sheets turned out to be a one-season wonder, batting just .230 with 10 home runs the following year. And by 1989, Sheets was an afterthought during Baltimore's improbable 2nd place finish, starting only 82 games and hitting just 7 homers in 338 plate appearances, all of which came as a DH or pinch hitter. 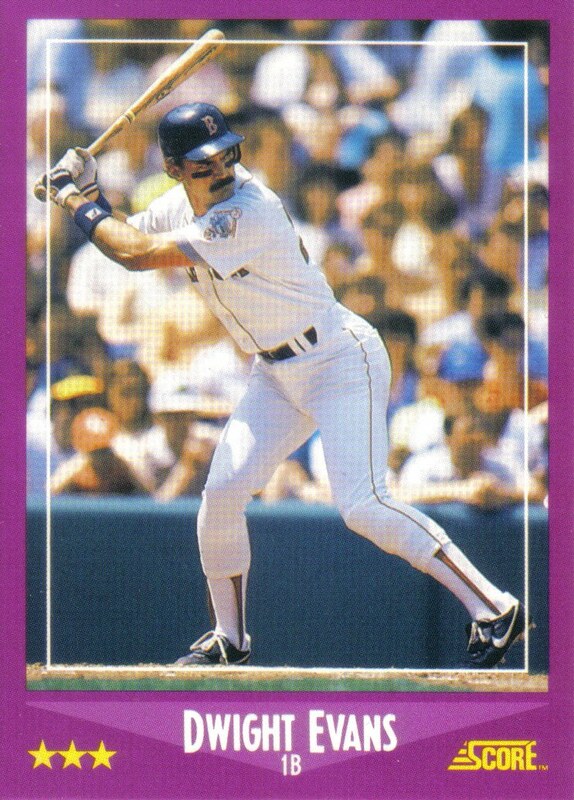 The 1989 season proved to Sheets' last with the team as he was sent to Detroit for infielder Mike Brumley. Sheets, along with '87 Oriole teammates Ken Dixon, Mike Young, and Ken Gerhart were all high draft picks, selected in the first five rounds, and represented the generation of Oriole ballplayers that the franchise hoped would lead the team into the next decade. However, none would ever become the star player the Orioles hoped they would. Scott McGregor, on the other hand, had more than fulfilled the promise that the Orioles saw in him when they plucked the left-handed pitcher from the Yankees' minor league system as part of the Doyle Alexander trade in June 1976. Selected by New York with the 14th overall pick in the 1972 draft, McGregor would be one of Baltimore's most durable and dependable pitchers over the next decade with several memorable wins for the franchise. McGregor more than proved his worth with a Pennant clinching six-hit shutout on the road versus the Angels in Game 4 of the 1979 ALCS. A week and a half later, McGregor pitched Game 7 of the World Series at home against the Pirates. Unfortunately, the lefty picked up the loss that day despite yielding only two runs in eight innings of work. McGregor was able to overcome the Game 7 loss and win a career high 20 games the next year and follow that up with an impressive 13-game winning performance during the strike-shortened 1981 season. McGregor had, perhaps, his best year in 1983, going 18-7 with a career best 3.18 ERA. During the '83 postseason, McGregor cemented his legacy as a postseason money pitcher when he one-upped his own 1979 ALCS shutout with a championship clinching five-hit shutout on the road against the Phillies in Game 5 of the 1983 World Series. Following a slightly off-form 1984 season, Baltimore signed McGregor to a 5-year contract. However, McGregor struggled to put together another impressive season and by 1987 shoulder injuries had started to take their toll on the lefty who managed just a 2-7 record with a 6.64 ERA. McGregor never did find his form again and he was released after just four starts into the following season, spelling an end to the popular veteran's career with the organization which was still on the hook for nearly two million dollars of McGregor's contract. 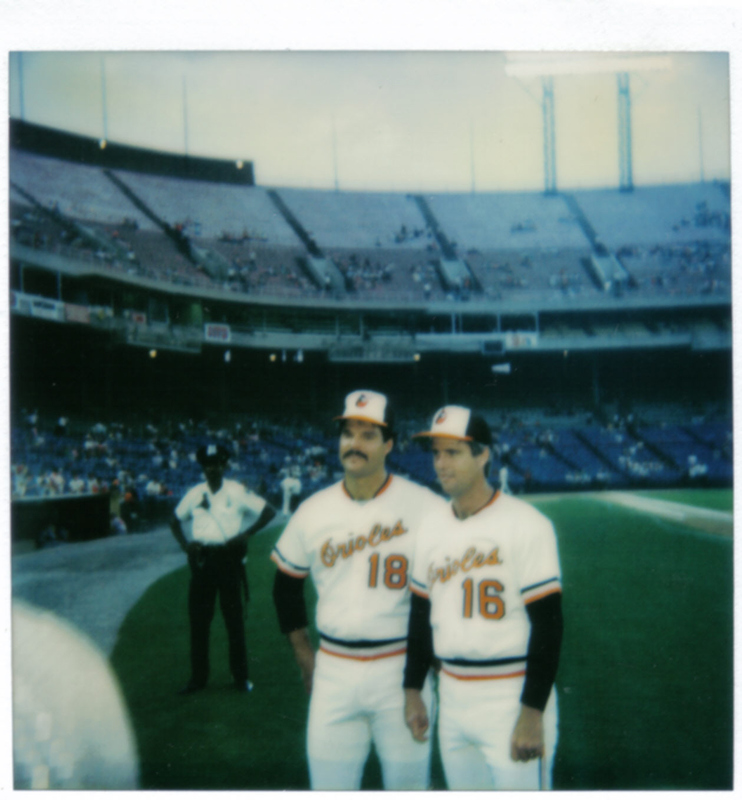 While Scott McGregor and Mike Flanagan made up the veteran half of the championship 1983 rotation, Mike Boddicker and Storm Davis made up the younger half of the rotation. After a stellar breakout '83 season, in which he went 16-8 with a 2.77 ERA, Boddicker followed that up with a Cy Young caliber season, going 20-11 with a 2.79 ERA, and was the AL leader in both wins and ERA. Aside from his excellent 1984 season, Boddicker, like his rotation mates, had trouble finding success following the '83 championship season, going a combined 26-29, in 1985 and 1986, while seeing his ERA balloon up to 4.40. 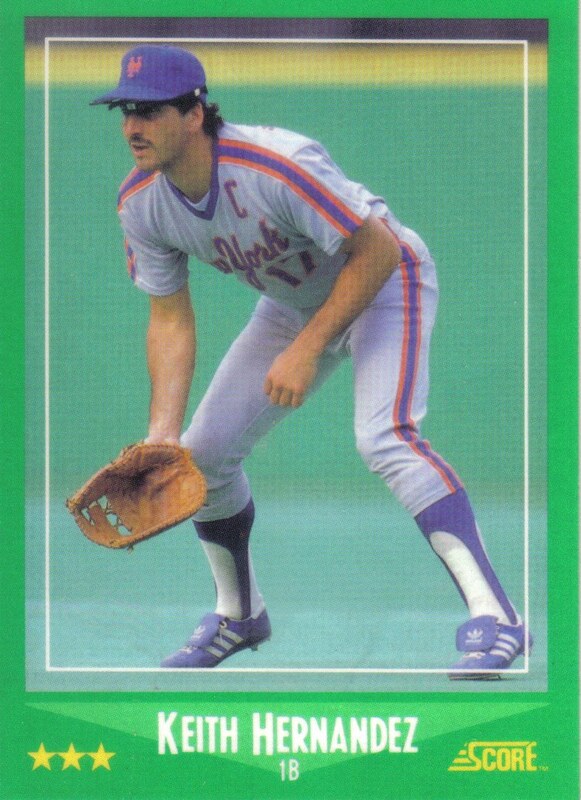 Unfortunately, the 1987 season was more of the same for the right-hander who went 10-12 with a 4.18 ERA. Still, Boddicker was by far the most dependable starter of Baltimore's beleaguered staff whose 5.01 team ERA was the second highest in the majors. Boddicker was the club's only pitcher to eclipse 200 innings and led the staff in several other categories including wins, games started, and strikeouts. 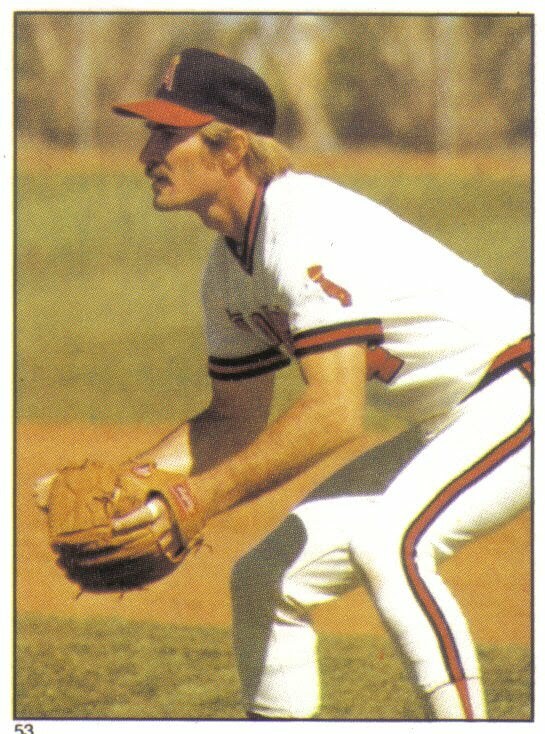 Storm Davis was the first of the '83 championship rotation to leave the organization, dispatched to San Diego following a subpar 1986 season for All-Star catcher Terry Kennedy and pitching prospect Mark Williamson. 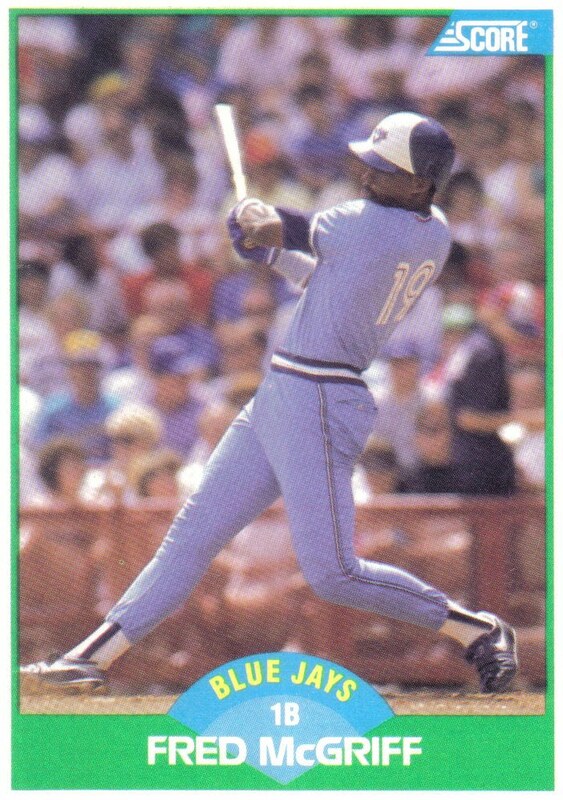 With Baltimore out of the 1987 AL East division race, Flanagan was traded to Toronto on August 31. After McGregor was released in May 1988, this left Boddicker as the sole remaining member of the 1983 championship rotation. Finally, with the Orioles once again out of the division race, Boddicker was traded to Boston in July 1988 for Curt Schilling and Brady Anderson. 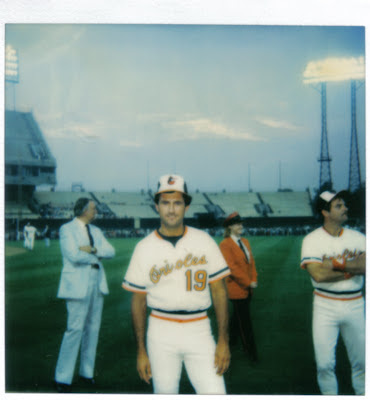 There would be good times again for Boddicker and the Orioles, just not together. 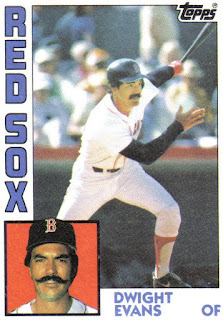 Boddicker would have the most successful post-Oriole career of his '83 rotation-mates, helping Boston to 1988 and 1990 division titles by winning 39 games in two and a half seasons with the Red Sox. Following an excellent 1990 campaign, Boddicker signed as free agent with Kansas City where he joined Storm Davis but they failed to rekindle the "Oriole Magic" of the 1983 championship season. Boddicker finally wrapped up his career after an unsuccessful stint with Milwaukee in 1993. Terry Crowley's origins with the Orioles date all the way back to being picked by the franchise in the 11th round of the 1966 draft. Crowley spent the bulk of his 15-year career playing for Earl Weaver, who primarily used him as a pinch hitter and in platoons against right-handed pitchers. Never a full-time player, Crowley only twice surpassed 200 plate appearances in a season but retired with a decent .345 career OBP. Crowley won two World Series rings as a player, the first one coming with Weaver and the Orioles over the Reds in 1970 and the second as a member of the "Big Red Machine" in 1975. In 1985, Crowley became Baltimore's hitting coach, a position he held until 1988. After eight years as Minnesota's hitting coach, Crowley returned as Baltimore's hitting coach in 1999, a position he held until 2010. Last season Crowley became the Orioles' roving hitting instructor and also filled in as bullpen coach when Mark Connor left the team. Catcher Terry Kennedy and right-handed pitcher Mark Williamson both came from San Diego to Baltimore in exchange for Storm Davis following the 1986 season. Kennedy replaced 1983 World Series MVP Rick Dempsey, the heart and soul of the championship team. At the time of the trade, Kennedy was one of the more prominent catchers of his day, a three-time All-Star who had helped San Diego win the 1984 NL Pennant. In 1987, Kennedy had a pretty good first half, batting .264 with 13 home runs, and made his fourth All-Star team. However, Kennedy struggled to hit his weight in the second-half, batting .230 while only adding 5 more home runs, and finished the season with a subpar .250 batting average. After a dismal 1988 season, Kennedy was swapped to San Francisco in return for catcher Bob Melvin. Kennedy helped San Francisco win the 1989 NL Pennant and stayed with the club until he retired after the 1991 season. Mark Williamson made 61 appearances, mostly in relief, for the 1987 Orioles. He finished the season with an 8-9 record and a 4.03 ERA. Williamson's biggest contributions came to the 1989 and 1990 Orioles when the righty went a combined 18-7 with a 2.62 ERA over almost 200 innings, all in relief. The '89 season was a bittersweet one for Baltimore and Williamson. Fresh off their 107-game losing 1988 debacle, the Orioles were only expected to contend for the cellar in 1989. In contrast to 1988's 21-game losing streak to start the season, the 1989 squad actually began the year 11-10, surprisingly tied with Milwaukee for first in the AL East. Even more shocking, the Orioles early success didn't fade as they spent all of July and August atop their weak division before finally being passed by the powerhouse Blue Jays. Along the way Williamson was the workhorse of the bullpen, pitching three innings or greater on ten separate occasions. For the last three games of the season, the Orioles went to Toronto needing to win all three against the Jays to take the division or two out of three to force a tiebreaker. At this point in the season, Williamson had already logged just over 100 innings in 60-plus appearances. In the first game, Williamson would be summoned to pitch the bottom of the 11th with the score even at one. Unfortunately for Williamson, he would pick up the loss when Lloyd Moseby singled Nelson Lirano home from second with two outs. Despite the loss, manager Frank Robinson showed his confidence in Williamson when he called upon the righty less than 24 hours later to save the second game of the series. Williamson entered the game in the bottom of the 8th with runners on 1st and 2nd and a 3-1 lead. Williamson retired the first batter but then gave up back-to-back singles to Mookie Wilson and Fred McGriff to tie the score. One batter later, clean up hitter George Bell put Toronto in the lead for good with a sacrifice fly that sent Wilson home and the Blue Jays to the division title. For both Williamson and the underdog Orioles, the Cinderella dream season was over. After being so dependable all year, the 100-plus innings of relief had finally caught up with Williamson and rendered the righty ineffective against the mighty Jays. Williamson followed up his excellent 1989 campaign with an even better 1990 season, despite the team nosediving back down below .500 to a 5th place finish. Williamson would pitch for four more seasons in the majors, all for Baltimore, but perhaps just as in the final week of the 1989 division race, all those consecutive nights of long outings took their toll on Williamson who never did find the form he had in '89 and '90. While the last few years of Williamson's career may have been forgettable he did make a memorable appearance on July 13, 1991: with Baltimore mired in the midst of another last place season, Williamson pitched the 8th inning of a combined no-hitter, on the road in Oakland, against the defending AL champion Athletics. Williamson shared the no-hitter with 1989 teammates Bob Milacki and Gregg Olson as well as with Oriole legend Mike Flanagan. These Polaroids were taken on Fuji Photo Night at Memorial Stadium during the latter part of the 1987 season. Despite being only four years removed from their 1983 World Series championship, by 1987, the proud Baltimore Orioles franchise had fallen on some very hard times. Baltimore's '83 championship season was followed by a subpar 5th place finish in 1984 and a slow start in 1985 which cost World Series winning manager Joe Altobelli his job. In his place, Baltimore brought Earl Weaver, the franchise's winningest manager, back from retirement. Initially, the move appeared to work with Weaver keeping the '86 Orioles on pace with the division leading Red Sox, sitting only two and a half games behind, in second place, with a 59-47 record on August 5. However, from that point forward, the team collapsed--going 14-42--and finished last for the first time since the franchise had moved to Baltimore, which sent Weaver back into retirement--this time for good. In Weaver's place the franchise promoted long-time 3rd base coach, Cal Ripken Sr. to manage the struggling ball club. 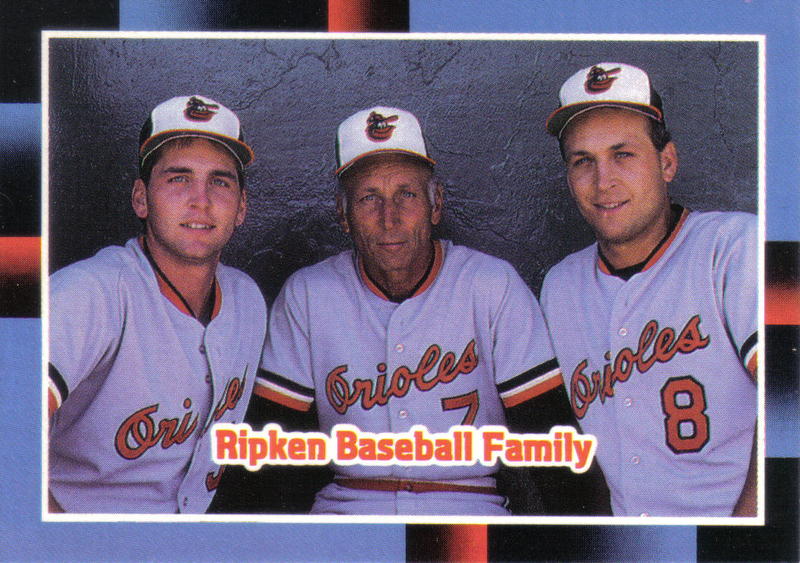 Probably the most memorable thing about the 1987 Orioles is that it marked the first, and thus far only, time in major league history a father, Cal Ripken Sr., managed two sons, Cal Jr. and Billy, on one team. Unfortunately, not even a trio of Ripkens could save the declining franchise from another horrid season as the O's record fell to 67-95. They were only saved from another season in the cellar by the Cleveland Indians and their ridiculously bad pitching staff. The following season proved to be even worse for Baltimore, with the team losing their first six games to start the season, leading to the dismissal of Ripken Sr. Cal Sr.'s replacement, Frank Robinson, failed to reverse the losing trend and the club lost fifteen more games in a row, setting a major league record with 21 straight losses to open the season. Not surprisingly, the Orioles finished last with an abysmal 54-107 record. You would be hard pressed to find a player who meant more to a franchise than Cal Ripken Jr. For twenty plus years, Ripken patrolled one half of the left side of Baltimore's infield. 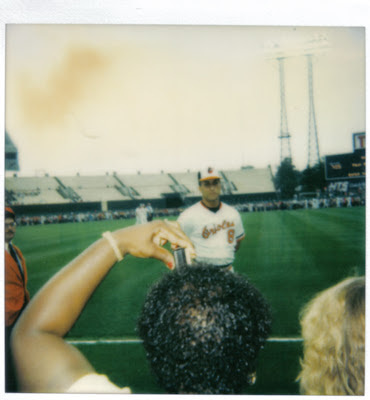 During that time Ripken saw the franchise through its final days at Memorial Stadium and into its move to beautiful Camden Yards. Cal played for several managers including Weaver, Altobelli, Cal Sr., Robinson, Johnny Oates, and Davey Johnson. 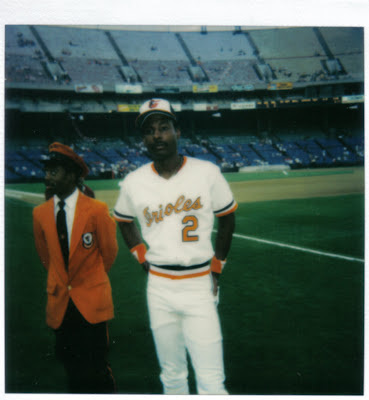 He won two MVP trophies, one during Baltimore's 1983 championship season and the other in 1991 as one of the few bright spots on a team that lost 95 games. Ripken also played under three different ownership regimes: the controversial but successful Edward Bennett Williams, the short, tumultuous reign of Eli Jacobs, and the initially successful, but otherwise frustrating tenure of the enigmatic Peter Angelos. Through all this Ripken played day in, day out, through injuries, through both good times and bad. In all Ripken would play 3,001 games in an Orioles uniform--with 2,632 coming consecutively. By the 1987 season, Earl Weaver and Jim Palmer had retired and Eddie Murray was falling out of favor with both the front office and the fans, so Ripken was beginning to evolve from the hometown fan favorite to the face of the franchise. 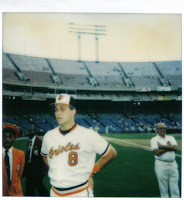 At this time Ripken was in the middle of a ten year stretch, from 1982 to 1991, during which he hit 21 or more home runs each season but 1987 was definitely an off-year for Ripken. 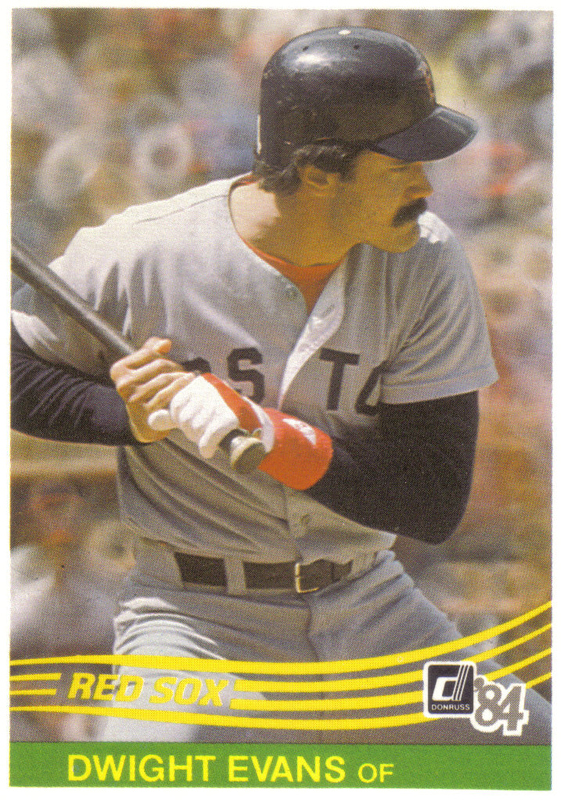 While Cal's 27 home runs and 98 RBIs may have looked good on the back of his baseball card, even a casual fan would notice his drop in batting average to a career low of .252, a particularly poor total when you consider 1987 was an extreme "hitter's year." Since Ripken's 2001 retirement, the Baltimore franchise has lacked direction and lost a large portion of its fan base. 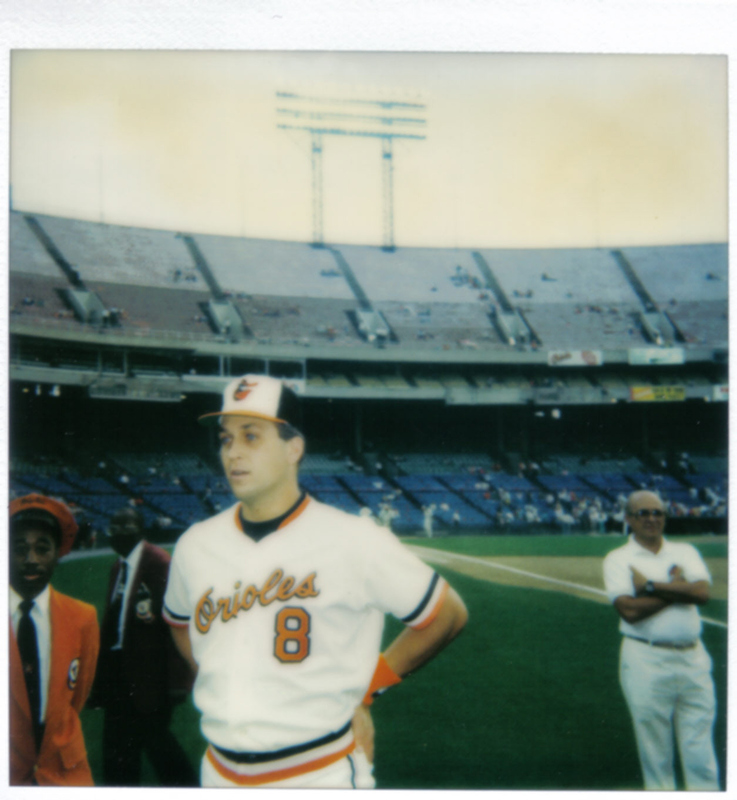 Even with a losing record, the Orioles were able to draw more than 3 million fans per year to Camden Yards during the last few years of Ripken's career and ranked in the top four of AL teams in attendance. 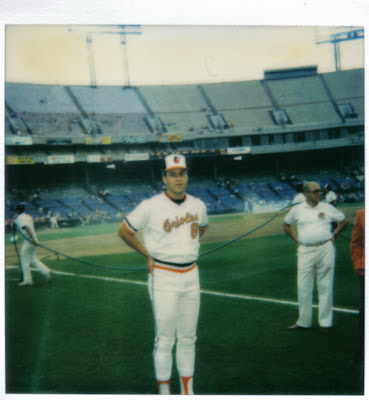 However, since his retirement, Baltimore has lacked drawing power and now places in the bottom half of AL teams in attendance, barely drawing half of the attendance they did during Ripken's final years. Many factors have contributed to this attendance drop: 14 straight losing seasons, the inability to contend in the AL East against rich, perennial playoff contenders New York and Boston, a front office which flip flops between youth movements and the signing of free agents, several Oriole players including Rafael Palmeiro, Miguel Tejeda, and Brian Roberts being linked to performance enhancing drugs, having to share the DC/Baltimore area with the Washington Nationals, as well as owner Peter Angelos' seeming indifference to Baltimore's loyal fan base. 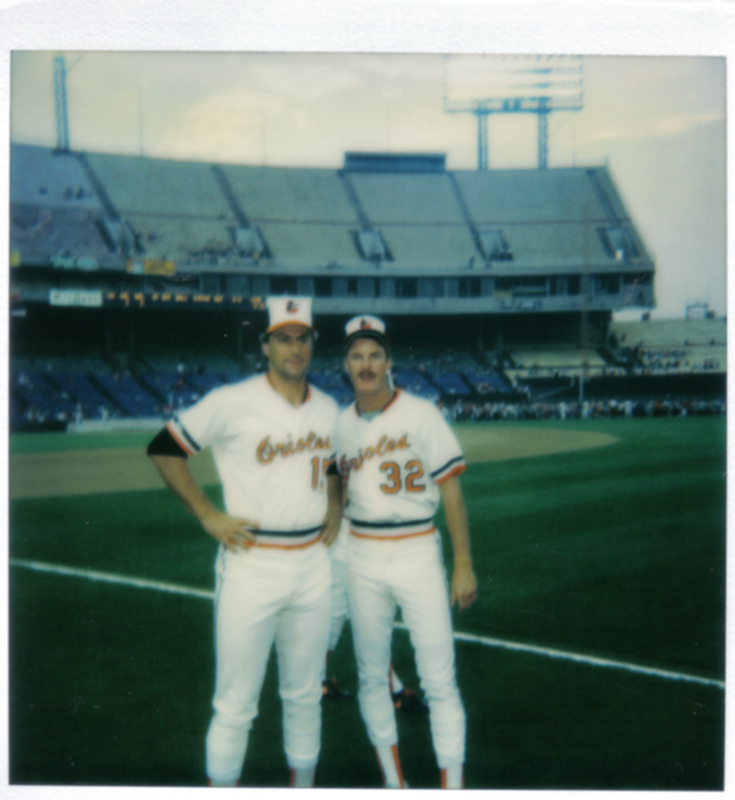 In July of '87, second baseman Billy Ripken joined brother Cal to form one of the league's most impressive keystone combinations. Ripken burst onto the scene with a .307 batting average and .363 on base percentage but fell back to Earth the following season with both his average and OBP dropping by more than one-hundred points. Ripken rebounded a bit in 1989 but probably had his best overall season in 1990 when he hit .291. After being released by the Orioles following the 1992 season, Ripken struggled to stay in the majors and spent time with Texas and Cleveland before returning to the club in 1996. Known as a "good-field, no-hit" player, Ripken mostly played second base during his career but also saw time at short, third, and first. After Joe Altobelli and the Orioles followed up their 1983 World Series triumph with a disappointing 5th place finish in 1984, the Baltimore front office wasted little time making moves that they felt would upgrade the on the field performance and spur the club back to another AL East title. Within the space of a week in December, the franchise signed relief pitcher Don Aase and outfielders Lee Lacy and Fred Lynn to free agent contracts. The biggest move of the three was the signing of Lynn, a former Rookie of the Year and MVP winner, to a 5-year 6.8 million dollar contract. If Lynn had any "buyer beware" tag on him it was his reputation for getting injured and not doing everything he could to stay in the line up. Unfortunately for the Orioles, Lynn lived up to his "oft-injured" reputation and missed ample time in each of his first three seasons with the team, only playing between 111 to 124 games during those years. In 1987, Lynn hit 23 home runs--the exact same number he hit in each of his first two seasons with Baltimore and his final year with the California Angels. 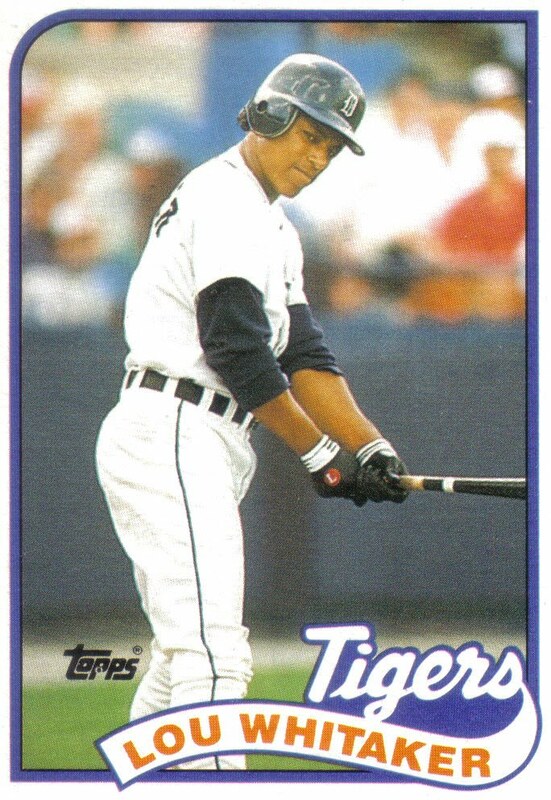 The following season, Lynn once again missed several games with injury and not surprisingly was traded from the slumping Orioles in late August to the Tigers for three minor leaguers, one of which was catcher Chris Hoiles. The trade worked out well for Baltimore as Hoiles would become the team's starting catcher for most of the '90's and hit 151 home runs in 10 seasons with the club. 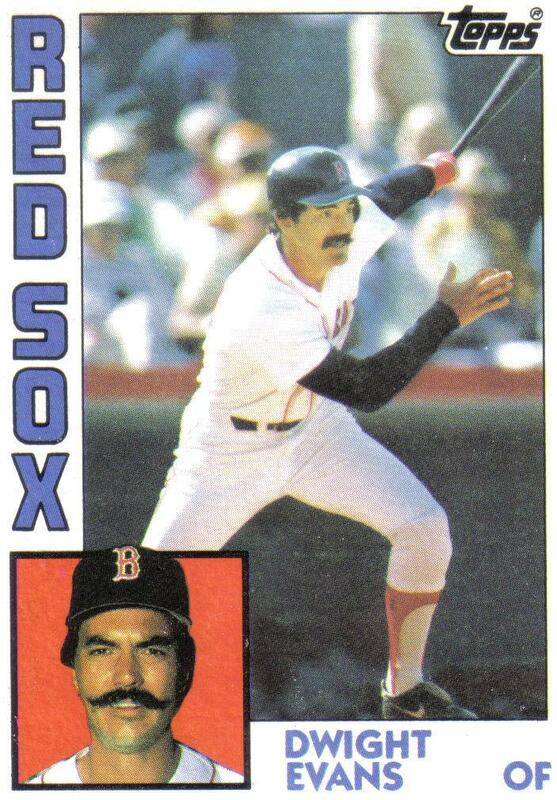 Lynn started his career in Boston sharing the outfield with Jim Rice and Dwight Evans and won both the Rookie of the Year and MVP in his first full year. He also won four Gold Gloves in centerfield and made the All-Star team each year from 1975 to 1983. When his 17-year career ended after the 1990 season, Lynn had 306 home runs in just under 2,000 games played--totals that could have been much higher if not for all the missed games. Injuries had really taken their toll on what could have been a Hall of Fame career for Lynn who only managed to play more than 140 games in a season four times. Prior to the 1985 season, Baltimore's front office took a big chance when it devoted a large chunk of its payroll to signing the talented, but oft-injured Fred Lynn to a multi-million dollar contract. Then, on June 27--with the club languishing in 5th place, just barely playing .500 ball--the front office took an even bigger chance when it traded for the Padres' troubled leadoff hitter Alan Wiggins. At his best, Wiggins was among the top leadoff hitters of his time, scoring 106 runs and stealing 70 bases the previous season for the pennant winning Padres. However, at his worst, the speedster could be undependable both on and off the field, as well as a disruptive presence in the clubhouse. At the time of the trade, Wiggins had been on the sidelines since late April when the San Diego front office had refused to let him rejoin the team after the speedster went AWOL during a road game series in Los Angeles and entered a drug rehabilitation center for the second time in three years due to cocaine addiction. The Padres had stood by Wiggins after a 1982 arrest for cocaine possession and even signed him to 4-year extension after his excellent 1984 season but they decided they had seen enough once Wiggins' troubles returned. Not only did Baltimore send two minor leaguers to San Diego but they also took on most of Wiggins' 2.5 million dollar contract which ran through 1988. In Wiggins, the Orioles saw a long term replacement for both Rich Dauer at second base and Al Bumbry at leadoff. Wiggins was quickly able to shake off the rust and batted a respectable .285 after the trade. Unfortunately, Wiggins struggled the following year, seeing a dip in batting average to .251, managing only four extra base hits in 270 plate appearances, and was even at one point demoted to Rochester, Baltimore's Triple-A affiliate. The 1987 season proved even more tumultuous with Wiggins first losing his second base position to rookie Billy Ripken in July, worsened when he got into a heated argument with teammate Jim Dwyer and manager Cal Ripken Sr. in early August, and finally ended with another drug related suspension at the end of August. Statistically, 1987 was Wiggins' worst season with the speedster hitting a career low .232 in what wound up being his final year in the majors. Tragically, Wiggins died from AIDS in January 1991, just a few weeks shy of his 33rd birthday.